Look back on all the Valentine’s Day you have celebrated with your partner all these years. The underlying theme was the romance and togetherness you had for each other. That made the usual colors pink or red, and the day was usually full of cakes and flowers and chocolates. While that is all very good, but when you have celebrated that kind of V-Day so many times already, you should now be thinking of celebrating this special day in a special way. Enough of candles and roses, it’s time for a new kind of Valentine’s Day for your loved one and you. Let us give you a few ideas which will allow you to celebrate the day in each other’s company, but with a different flavor. Find out the address of an old age home nearest to your house and reach there on the morning of V-Day with a load of chocolates and cakes. Share them with the inmates there, and shower your love on them. The blessings you and your partner will receive will easily last you through the year and more. The smiles on the faces of the inmates will stay with you a lifetime, though. 2.Celebrate the day as grunge day! Take leave from your respective offices and wake up as late as you possibly can. Order all your meals in, starting with a late breakfast. Spend the whole day in your home clothes watching old movies or the latest television series on your TV. If you have got through all that you want to watch, then play some favorite music. Loafing around with nothing to do feels great any day, but on this special day it will feel doubly special! 3.Go on a vacation. But make it different from the usual vacation which has misty hills and pristine beaches. Charter a yacht, for example, and sail around in it for a couple of days. 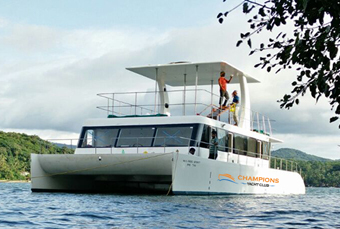 There are some good companies which offer such services, like Champions Yacht Club. They also provide other types of vessels for hire, like speedboats, motor yachts, power boats, inflatable boats etc. 4.We know how busy you are throughout the year. Make this day special for each other by drawing up a list of 5 relatives (including parents) of both partners and calling them up together. In case you are celebrating Valentine’s Day in Goa with a partner who is not yet a spouse, then you can make those calls to your respective friends. This will help immensely in your mutual bonding. Ensure you plan your honeymoon yourself- The reason why I’m asking it to do it yourself is that, when you leave it to your wedding planner, you’d probably see some unnecessary additions to your honeymoon package. When you and your spouse plan your honeymoon, it’s very personalized and set just the way you like it and is budget friendly too. Or, you can always pick out packages like honeymoon packages to Dubai, for example or pick out customized honeymoon packages! Pick out the right time of the year- Imagine you’d rent a yacht in Goa during May and sign up for a honeymoon package cruise in Goa. Would you enjoy it? Not really. During months like October and the latter half of the year, Goa is pretty lovely- romantic dinner cruises in Goa are beautiful and it’s just perfect! Pick out the right time of the year enriches the experience and save up on crucial money in no time. Remember, honeymoons should have its quality in- tact. Do not compromise, ever! Make use of the right credit card(s)- What if you used credit cards which charge you 15% extra as the rate of interest? Not a good idea! Pick out the right interest- rated credit cards. Also, the budget comes into the picture. You’re about to start a family- do not go overboard because you’re celebrating your wedding. Foreign transaction fees should also be taken into consideration. Give emphasis to all-inclusive cruise packages– All inclusive packages refer to packages inclusive of cruise rides, overnight stay on- board, water sports and more. All-inclusive cruise packages are definitely a lot more affordable than signing up for separate packages. Alternative accommodations- Changing your accommodation from a 5-star hotel to a houseboat can make a huge difference in the expenses you make as a couple. Remember, the big picture is the experience, not how big your room was. Go local- One of the best possible ways to keep your honeymoon safe and amazing is by keeping things simple and staying in your native place. For example, an Indian can go to Goa for their honeymoon. Imagine, you’ve rent a yacht in Goa and sign up for an overnight stay in Goa package under the honeymoon package in Goa and enjoy gourmet quality restaurant food, personal DJ, customized set-ups and so on in the month of November, right after your wedding. How awesome would that be? Cold months are already nearing towards the end, with summer months gearing up for hotter months. As coming months are hot and humid it calls for a beach vacation. 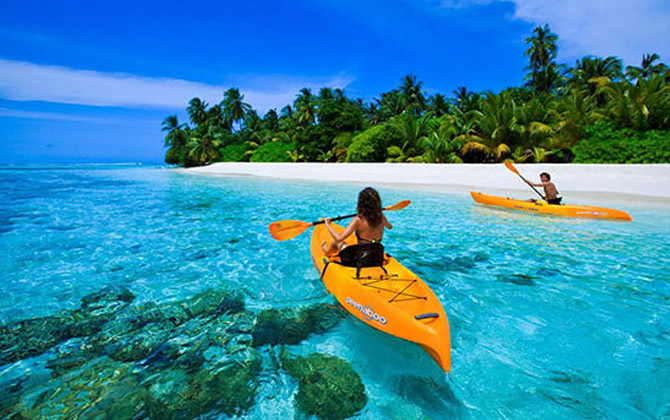 Goa being the beach capital of India, witnesses a large number of tourists every year. The tropical weather, perfect balance of flora and fauna with great culinary options in abundance are one of the prime reasons why Goa tops the best places to visit in India list. 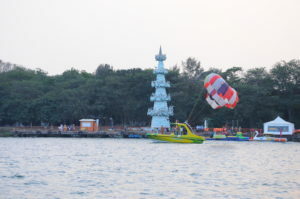 Other than being a delightful place to shop, eat and explore it is also known for an array of watersports in Goa. You might find a large base of information on what and what not to do in Goa, but what about the carry-ons and luggage preferences when you plan for a vacation? Having the aid of right thing at the right time definitely makes your trip more carefree, fun and enjoyable. So, here is a list of key essential things you should always have while planning a beach holiday to places like Goa. Sunscreen: Beach holiday is definitely going to give you a lot of beach tan. Tan is not an issue as it fades eventually, but sunscreen helps prevents from cancer-causing UV rays. You should always invest on a good sunscreen ranging from 50-100 SPF as it helps you to stay protected for a longer time. So, while you are getting ready do not forget to put sunscreen keep your skin glow intact. Don’t be a victim to sunburn or hyperpigmentation that’s a common occurrence on beach holidays. Enjoy, but be skin safe! Sunglasses: Yes, needless to say but always carry a reflector and a good branded pair of sunglasses having the film for both UV and UVA protection. Eyes are one of the most sensitive parts of the body, so keep you glares intact while sight-seeing, chilling on a shack or enjoying a sunset cruise in Goa. A sunglass not just helps your eyes from harsh rays, but also keeping your eyes helps in preventing fine lines and wrinkles. First aid kit: Not just a beach holiday, but every travel plan should have a first aid kit as an essential condiment. 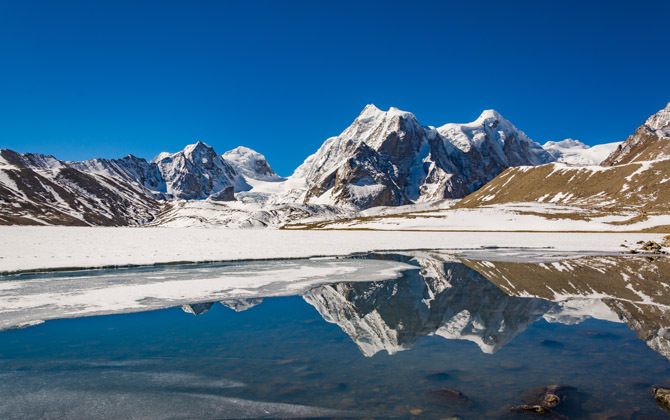 You might travel to far remote places or experience discomfort due to any sudden change. Keep your bag stuffed with antacids, preventive medicines, painkillers, Band-Aids, antiseptic creams and other prescribed medicines if any. Prevention is better than cure, and what better that stay alert with the minimum necessities for emergencies. Dry Snacks: No, we are not asking you to carry multiple packets of food and beverages, but always carry small food packets and water bottles. In case the wait time at a restaurant is longer than expected or you travel to a place without any eating joints, you can make use of the dry snacks. Carry packets that are compact and easy to carry with things like dry fruits, cookies, dehydrated fruits, potato chips, chocolates, nuts and much more. Waterproof bag pack and zip locks: When traveling to a beach or planning for watersports in Goa, it advisory to carry a waterproof bag and bunch of zip lock bags. Not just the convenience, but it provides you to segregate things and making things less messy. Additional storage is always a good idea and probably it will help you to carry wet clothes, slippers or even store essentials from getting wet or accumulating moisture. Selfie stick and portable charger: What is a vacation without a few good and goofy pictures? At this age of selfies and social media rage, surely you want to miss out on cool pictures for your social media feed. So, make sure to pack you best camera along with essential with your portable charger that will help you keep your phone battery up and running. As you would be out for long period of times, it’s better to carry a charger that keeps your devices active throughout. Mat and Beach slippers: When planning for a day out at the beach do not forget to carry a mat and beach slippers. Watersports’, playing on the beach or just hanging around with friends, beach vacation is no fun in tight clothes and fancy shoes. So, carry your beach slippers with you to have all the carry without having to fuss about pain and shoe bites. Also, carry a mat to have your set of accommodation in case you do not find places to hang along the shack or any good pubs. It’s a great way to lounge around and watch the sunrise or sink into the roar of beach waves. Cash in hand: Goa is undoubtedly a tourist spot, but many the well-known shacks and shops based in flea markets do not accept cash. So, it’s advisable to carry a good amount of cash to make transactions without any hassle. It will make your shopping experience much easier and convenient. So, these are a few essential components to pack for a beach vacation. Smart packing not only makes your journey easier but ensures that you have a great vacation without having the fear of missing out essentials. Honeymoon is arguably one of the most important chapters in new couples travel dairy. It is not just to celebrate the togetherness and equity of a new relationship but has to be perfection in every way possible. 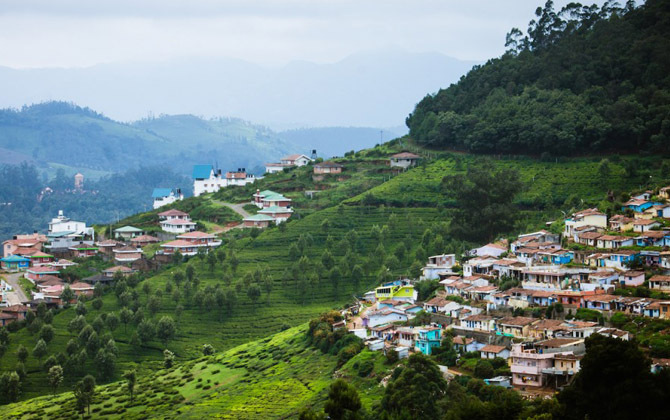 As ,India is a land to many globally known honeymoon destinations, it makes it quite difficult choose the best among so many options available. Starting from surreal beaches to heritage monuments you can choose anything that matches your preference. There are many travel tours and packages that can craft splendid and customized honeymoon packages that suit every mood and budget. So, here in this blog, we will talk about few of these destinations which are one of the most preferable spots when it comes to plan a honeymoon. Might sound clichéd and overrated, but it’s one of the best destinations that can catch you in awe of it surreal landscapes. It has been a constant hit amongst couples from a past few years. Starting from snow cladded mountain peak, beautiful local sights to good comfort food Shimla has it all. 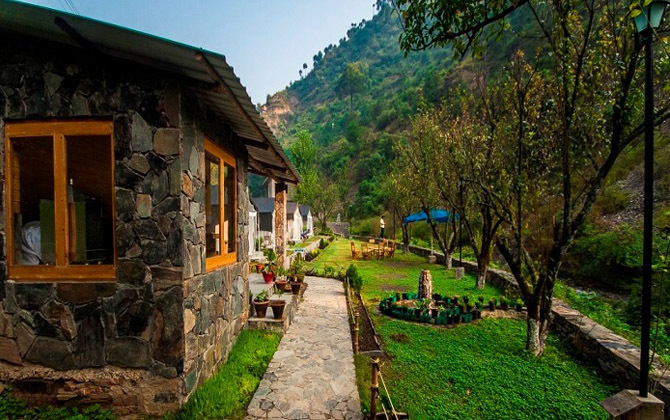 A dreamy location in Dharamshala, which is beautiful with timeless Buddhist monasteries, mountain peaks and rich Pahari culture. One of the frequently visited buy hipster travelers and bloggers it gives out great backdrops for images and suits best for a short romantic trip. So, never hesitate to plan a trip here. Goa is a place like fine old wine, no matter how old it is just keeps getting better with years of existence. Goa is a place which serves right for every kind of couple starting from the energetic and adventurous couple to calm loving couples. It’s one of the few destinations which will not cease to amaze you in many different ways. Either you can choose a beach view resort of a cruise in Goa, the surroundings with endless beaches with a colonial touch gives you the right amount of holiday vibes. You can even book for a yacht party in Goa which is one of the best ways to explore the nightlife. 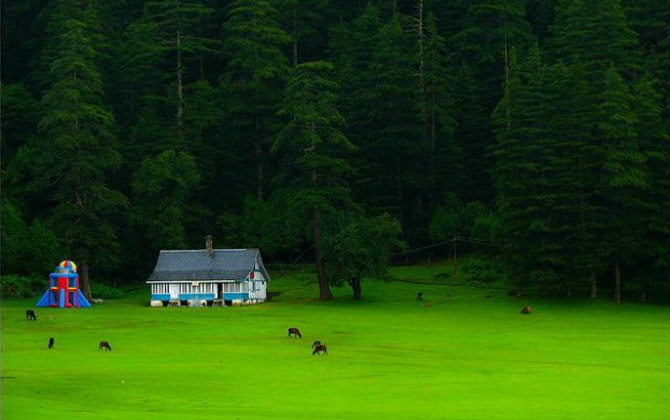 Dalhousie is one of the best places if you love to sit back, relax sip on hot coco and finish a long pending book. Breathtaking snow clad mountains with pine tree will help you distress from all the city chaos. Known for its picturesque sights and pleasant weather throughout it is often compared to Switzerland for one of its landmarks. Apart from natural tourist destinations, it is also home to lakes, waterfalls and many monuments. One thing is for sure Dalhousie will be one of the best places in your travel journal. Not just the name, but the destination is also intricate with surrounded with clear water bodies. If you love the beach, aquatic life, dense coral reef that too with minimal crowded areas then Lakshadweep has 36 of them for you. 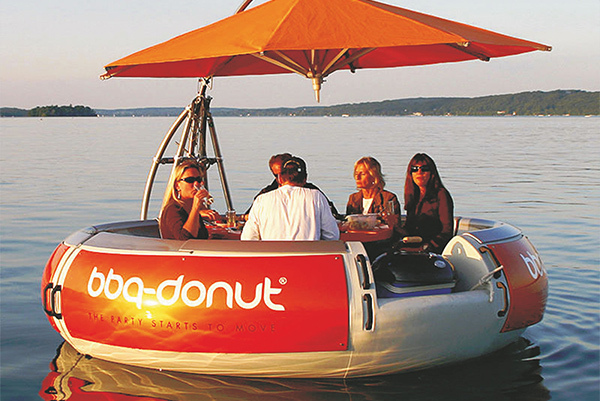 Adding to that there are local eateries, shell filled islands with cruise ride facilities. If you are someone who appreciates a relaxing vacation it would be a great choice for you. Andaman & Nicobar Islands hold a reputed linage of one of the most dreamy beach destinations in India. It offers a lot of water sports and activities with many historical moments that stand testimony several phases of pre-freedom era. 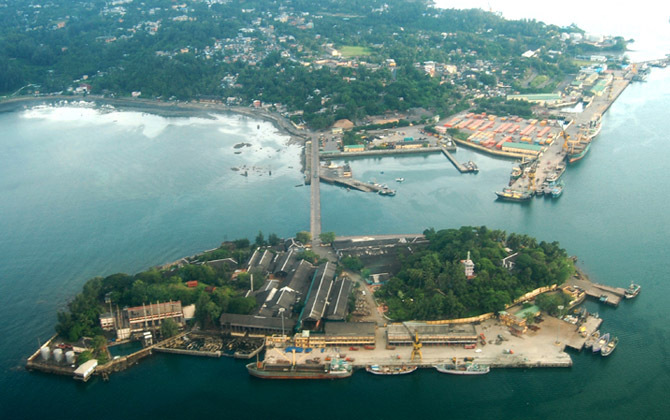 Port Blair is the capital city from where you can commence a trip of sightseeing, exploring and many more beach surprises. 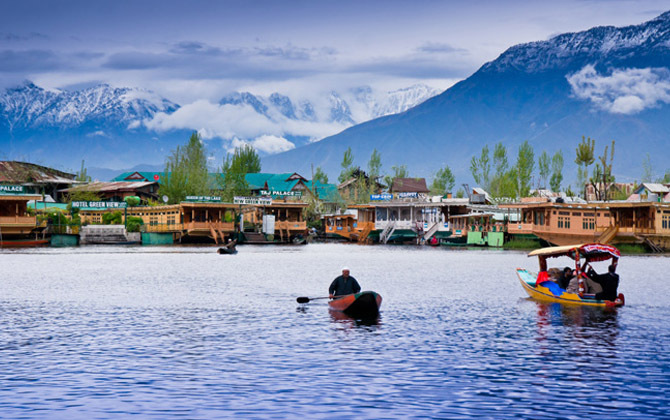 The serenity of Dal Lake, floating shikaras with beautiful valleys are even better with rich flora and fauna. It gives out an old world aura that serves as the best way to have and calm and lay back holiday. 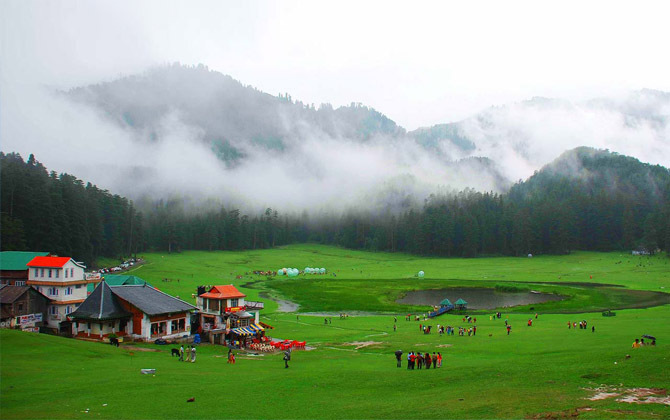 Not to forget the innumerable tourist spots and garden every sight of Kashmir is mesmerizing. Known for architectural marvel, forts, great Rajasthan cuisine you can have a great experience on desert safari, camel ride and not to forget freshwater lakes with spellbinding beauty. 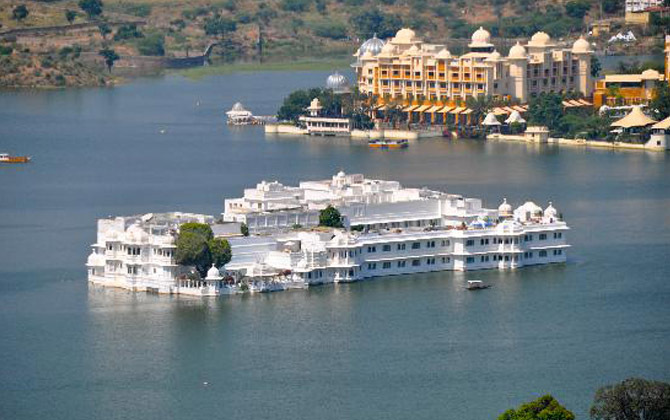 Udaipur and even the entire Rajasthan is a travelers delight with full of vivid colors, cultural wonder and handicrafts all around. The brilliance of culture and craft shows through the lifestyle, food, monuments and even religious spots. So, these are few destinations which can be your top choices for destinations this year. The best part about these destinations are these can be planned last minute with a minimal budget. These places can give tough competition to many foreign locations that too at one-fourth of the budget. So, why waste time on extensive research, planning, and financial resources, finalize one from the list and enjoy a great holiday with your beloved. 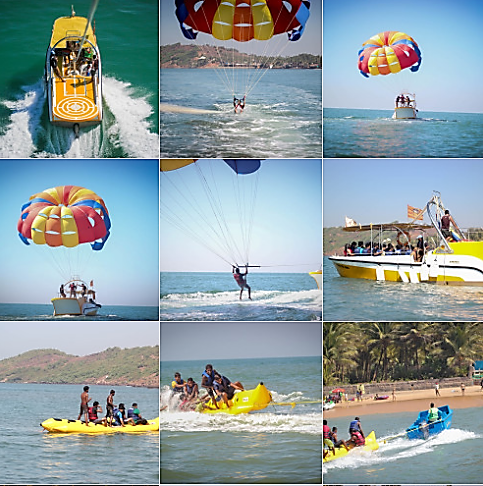 You know you are in Goa if you get soaked by the beach waves, adventure cruising, island hopping, yacht tours and a plethora of inviting water sports tempting you to try them out! 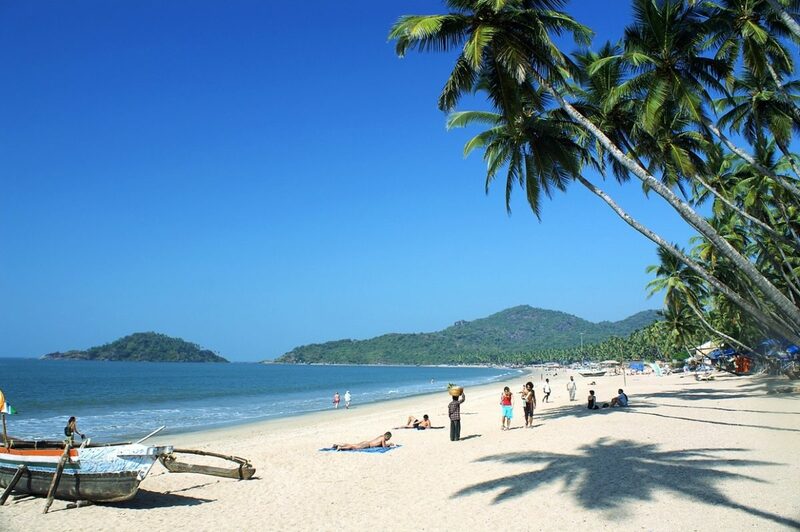 Goa is indeed, a paradise of a total of 22 beaches naturally diversified into two districts: North Goa & South Goa. But if you think beaches are the only source of fun & adventure, you are wrong! Beach adventures are way too mainstream; instead why not try out some of the exciting river adventures & activities that can offer you a whole new level of fun! And these are indeed such aspirational travel moments that money alone can’t buy! Time to turn out to be a river fanatic! Ditch the crowded beaches; the Rivers of Goa, the backwaters & the scenic wildlife of Goa are so unique in their potential to attract tourists that they speak for themselves for both leisure & adrenaline. Goa reveals a number of unexplored and gorgeous rivers, tributaries and popular water bodies with breath-taking landscape that are flavourful attractions for the young & the vibrant crowd. And the best part? These river bodies are mostly isolated with only a handful of people around; so it’s a cozy experience to devour all the fun & splendour with your special sweetheart, friends or family. It’s a bet- you won’t find this kind of serenity elsewhere! Goa has developed into a thriving tourism sector because of the presence of vivacious beaches, islands, the tranquil lagoons and blissful picturesque landscape. Located at the western coastal region along the boundary of the large sea coastline of the Arabian Sea, Goa is the paradise of the most exotic beaches surrounded by the lush greenery and fascinating backdrop. Goa is blessed with a total of 9 beautiful rivers joined by 42 other small tributaries that flows from the Western Ghats and then downpours into the sea. This frames an extensive network of navigable inland waters comprising the beautiful backwaters in Goa. 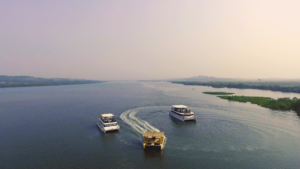 But unlike the beaches, Goan Rivers are the most unexplored & uncrowded destinations that opens up new possibilities for unforgettable sightseeing spots, water sports adventures & cruising opportunities to the discerned travellers. The biggest & popular rivers of Goa such as Saleri, Chapora, Baga, Talpena, Zuari, Tiracol , Sal, Galgibaga marks Goa’s entry into the exciting world of adventures in river tourism. Several isolated smaller rivers that flows criss-cross along the state will be adding up to the tourism flavour in the coming years. The most recognizable river bodies that deserve a visit are the Mandovi & the Zuari. These water bodies gives abundant opportunity to rediscover the calm & tranquil nature by means of outdoor water sport activities such as trekking, cruising, water adventures in Goa, underwater activities, Goa sightseeing and heritage, crocodile dundee, bird watching and more. Nearly 4 million tourists visit Goa each year, out of which half a million are foreigners. So now you know the rising potential of Goa’s tourism industry every year. Goa, the state that host many locals, domestic and foreign travellers is currently a tourism hotbed as special initiatives from the state Govt. is instrumental in boosting tourism. The flowing waterbodies has greater potential for water park tourism & river based transport systems. Few waterfronts such as the Chapora River & the backwaters that remained untapped for a long time has forced Goa’s tourism industry to exploit the rich flora & fauna along the River ways and develop certain points of tourist interest. 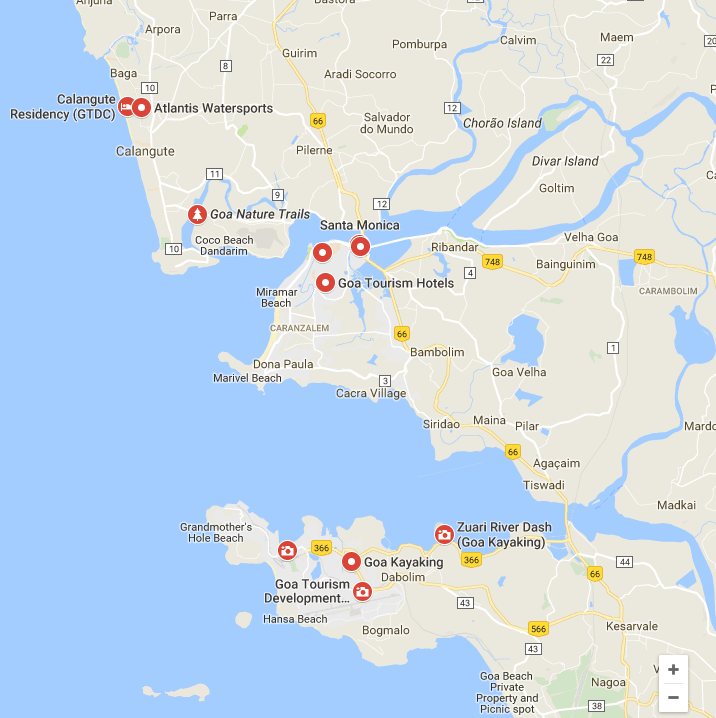 With the intent to increase river transport usages by the govt., the growing importance of River jetties and small boats are greatly sought after that can aid to leisure tourism services, spread evenly across all parts of Goa, not just beaches. If you love boat racing amidst a peaceful ambience, Goan Rivers can offer you a unique leisure waterfront space & experience that is way too different from the sea waves. River water sports such as white water rafting, fishing, yachting, kayaking, Ringo ride, and paddle boat rides, canoeing, are just perfect adventure water sports to explore & challenge the river water currents. White water rafting is an easy-to-navigate all year-round adrenaline buzz. While it’s easy to manoeuvre adventure kayaks downriver, canoeing is another fun-filled activity to try your hands on. Other water activities that you can test your marine skills are rowing and Coracling that adds loads of amusement to the tourists riders. The beauty of the river water sports is that they are user friendly and can be tried and experienced by anyone; all you need to do is just practice a little balance & control, and there you are…ready to go! For novices as well as professionals, these river water sports are a great pastime and for adventure seekers, these are the best water sports to gather some real life time moments with friends & families. But don’t you worry if you are a first-timer because even for the first-timers, river water sports offer something exciting. To help you find some of the best river water sports that you can enjoy in Goa, here’s an extensive list that we have handpicked especially for you. Take a sneak peek! 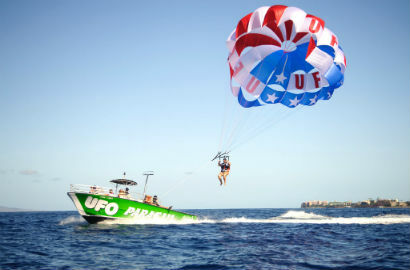 A popular water sport to try on, parasailing is an easy adventure water activity that you can try out. Take off to get a spectacular aerial view of boundless waters from a high altitude. Experience the adrenaline rush as you glide through the air! Enjoy the breath-taking view! Away from the beach wilderness, white river water rafting is an adventure that offers plenty of thrills to the intrepid visitors. This up-and-go activity in a group is especially designed for lakes, rivers and seas where you can explore magnificent views & inaccessible river banks. This action sport activity is loaded with tons of uninterrupted fun and thrilling experience. Let water push you up as you stand high above the waters. Fly like a superhero up till 15 to 30 meters above the water pumping up your adrenaline. 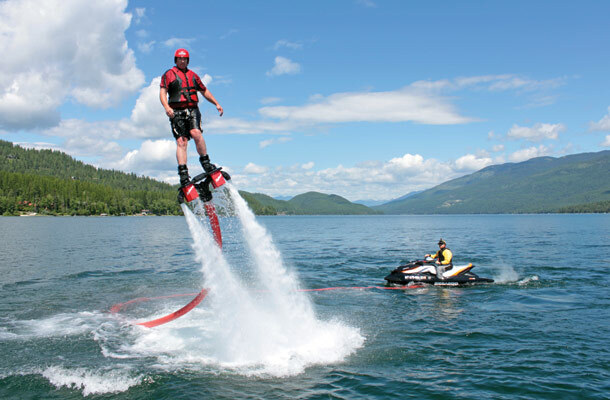 Make splashes as you swirl your fly board strapped at your feet up in the air to rotate and turn. Chase the ski, take 360 degree spins and S- it’s a sensation that includes tips & tricks as you apply the skills of turns as you dive into the water and shoot back out again. It is an elastic ring shaped boat where you can easily fit in that is towed by the behind the speed boat. Whether single Ringo ride or doubles and bingo! Don’t be afraid for a freefall in waters. Feel each bump, twists & trills as you splash through waters on the way! 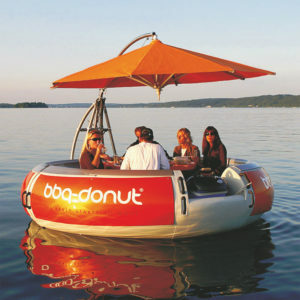 Round leisure boats are shared adventures for those who want to sail away the laidback time with all comfort. Try out a round leisure boat ride for a fascinating slow journey on beautiful calm waters. Explore pristine corners away from the hustle & bustle of the city. This is a great sightseeing tour to be enjoyed in a group as it speeds up. Experience this great thrill of speed, fun and adventure on-board as you top it up to 50mph. 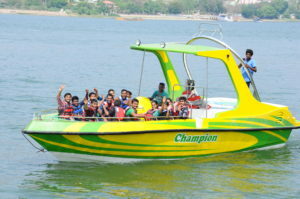 This passenger speedboat offers loads of fun to the young & the old when it spins at top speed, giving an adrenaline rush to the adventure junkies. For those who are looking for a relaxing experience, this is a thrilling ride to explore. 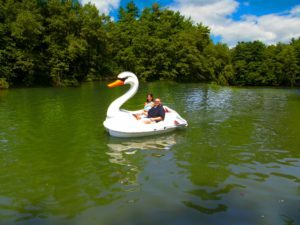 Enjoy an intimate time with swan boat ride as you circle around the lake with your special one. Slow down your time for tranquil moment of peace and serenity as you pedal to explore the charms of the lake in a leisurely manner. 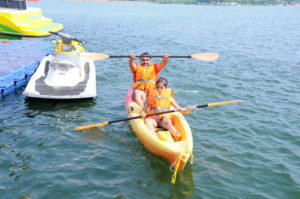 This is the most scenic sport to be enjoyed along the coast, rivers, lakes & backwaters of Goa. Glide through the excursion routes where you find the mangroves & other orchards to explore magnificent views abounding rare birdlife species and diverse flora & fauna. Ride your way on pristine calm waters! The best thing about this water sport activity is that you can fearlessly dive into the crazy water fun without getting wet! Yes, Rolling up and down or walking inside the transparent ball shaped space of unknown seems exciting! 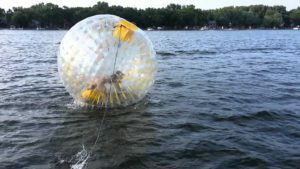 That’s the fun more than scary that you feel inside a Zorb ball. Try it out! Pollution free solar boats are highly enjoyable to take a ride on against the rhythm of the river. Feel the cool breeze as you ride this 100% solar powered boat on calm waters. Experience perfect leisure moments with family and friends. For speed lovers, Jet Ski is the most cherished & exciting river water sports. Climb aboard the private Jet Ski for some quick action packed fun and entertainment. Enjoy a thrilling ride through the waves as you feel the water splashing by all around! 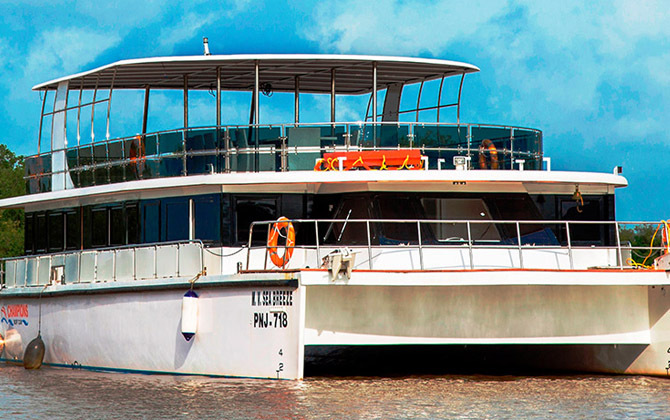 If you are a wanderlust explorer, river cruising opportunity is sure to leave you spellbound and in awe. Spend evenings at the top deck of the cruise on-board. Explore exciting and thrilling experiences packed with fun, excitement and luxury while cruising. The breath-taking views from the cruise deck and the LIVE music along with gourmet dining & attentive hospitality is sure to enrich the unique experience on-board. Apart from these water sports & cruising experiences mentioned above, you can also enjoy various sightseeing, bird watching and riverside recreational hopping experiences that are of a great value for money. For bird lovers, Champions Yacht Club provides early morning boat services where you can spot some of the rarest species of birds. All these will definitely make your Goa vacation exciting and memorable. So, does this River water adventure beckon you? Why River Tourism in Goa is all-inspiring for adventure seekers? But if you think beaches are the only source of fun & adventure, you are wrong! 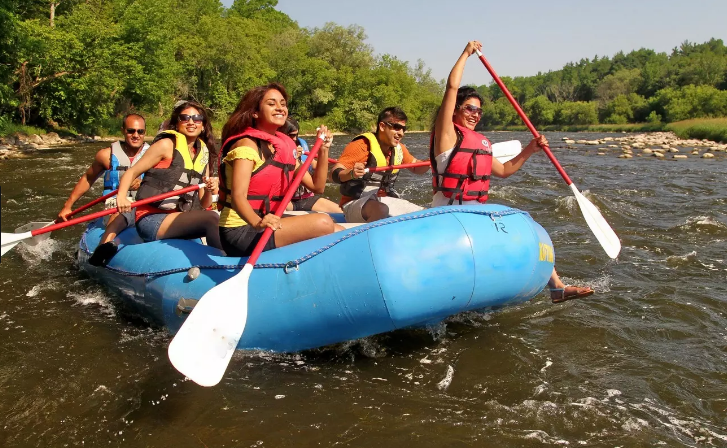 Beach adventures are way too mainstream; instead why not try out some of the exciting river adventures & activities that can offer you a whole new level of fun! And these are indeed such aspirational travel moments that even money can’t buy! Time to turn out to be river fanatic! Ditch the crowded beaches; the Rivers of Goa, the backwaters & the scenic wildlife of Goa are so unique in their potential to attract tourists that they speak for themselves for both leisure & adrenaline. Goa reveals a number of unexplored and gorgeous rivers, tributaries and popular water bodies with breath-taking landscape that are flavourful attractions for the young & the vibrant crowd. And the best part? Well, these river bodies are mostly isolated with only a handful of people around; so it’s only you to experience all the fun & splendour with your special sweetheart, friends or family. So, it’s a bet- you won’t find the serenity elsewhere! Goa has developed into a thriving tourism sector because of the presence of vivacious beaches, islands, the tranquil lagoons and blissful picturesque landscape. Located at the western coastal region along the boundary of the large sea coastline of the Arabian Sea, Goa is the paradise of the most exotic beaches surrounded by lush greens and fascinating backdrop. Goa is blessed with a total of 9 beautiful rivers joined by 42 other small tributaries that flows from the Western Ghats and then downpours into the sea. This frames an extensive network of navigable inland waters comprising the beautiful backwaters in Goa. 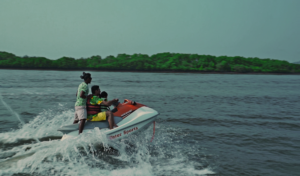 If you love boat racing amidst a peaceful ambience, Goan Rivers can offer you a unique leisure waterfront space & experience that is way too different from the sea waves. River water sports such as white water rafting, fishing, yachting, kayaking, Ringo ride, and paddle boat rides, canoeing, are just perfect adventure water sports to explore & challenge the river water currents. White water rafting is an easy-to-navigate all year-round adrenaline buzz, sailed across the water currents. 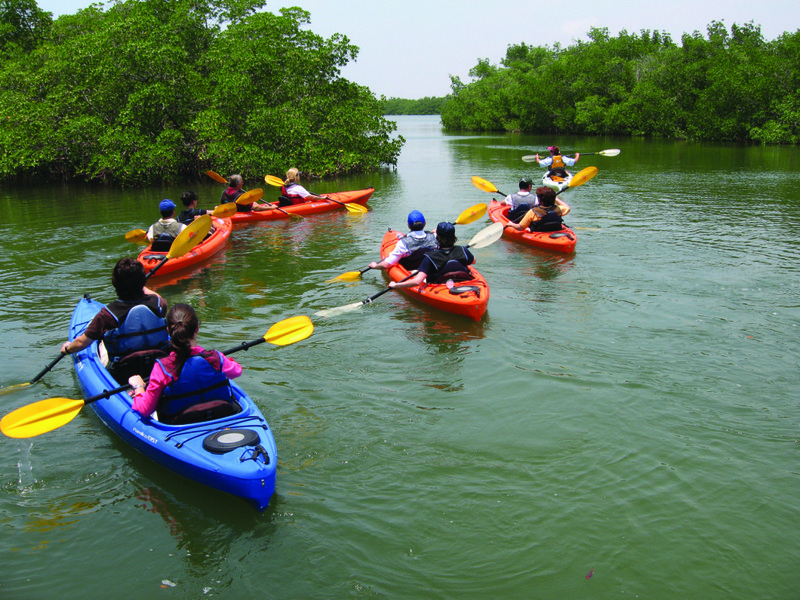 While it’s easy to manoeuvre adventure kayaks downriver, canoeing is another fun-filled activity to try your hands on. Other water activities that you can test your marine skills are rowing and Coracling that adds loads of amusement to the tourists riders. The beauty of the river water sports is that they are user friendly and can be tried and experienced by anyone; all you need to do is just practice a little balance & control, and there you are…ready to go! For novices as well as professionals, these river water sports are a great pastime and for adventure seekers, these are the best water sports to gather some real life time moments with friends & families. But don’t you worry if you are a first-timer because even for the first-timers, river water sports offer something exciting to everyone. This action sport activity is loaded with tons of uninterrupted fun and thrilling experience. Let water push you up as you stand high above the waters. Fly like a superhero up till 15 to 30 meters above the water pumping up your adrenaline. Make splashes as you swirl your fly board strapped at your feet up in the air to rotate and turn. Chase the ski, take 360 degree spins – it’s a sensation that includes tips & tricks as you apply the skills of turns as you dive into the water and shoot back out again.